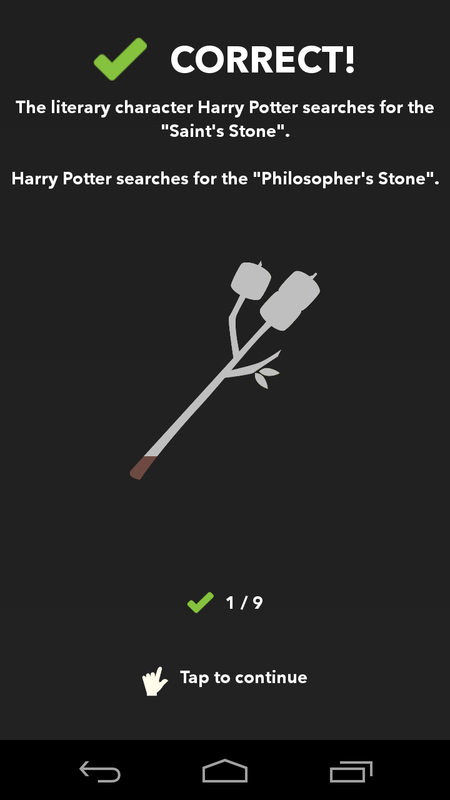 True or False - Test Your Wits: A New Puzzle Hit? 4 Pics, 1 Word was a huge hit worldwide. Tens of millions of Android users installed the fairly simple game on their devices since its release. The makers of this hit have now released a new game, called True or False - Test Your Wits. Faithful to the title, this is a simple true/false game, but is it as good as 4 Pics, 1 Word? Find out in today's review. From the makers of 4 Pics, 1 Word comes True or False - Test Your Wits which has already been downloaded 1-5 million times. With regards to the scope of the app the permissions all seem to be in order. True or False can be played in two different versions, single player and multiplayer. The gameplay, however, is identical in both versions. The aim of the game is to answer True or False to the displayed statements in a reasonable time frame. The statements originate from different areas of knowledge and include, for example, music, politics and literature. In single player, the player must work his way through by solving one level after another. The requirements of each level constantly change, so that not only the difficulty of the questions, but also tricky wording of statements try to throw you off. The conditions for each level consist of the required number of correct answers, the available spare lives and the ''free passes.'' 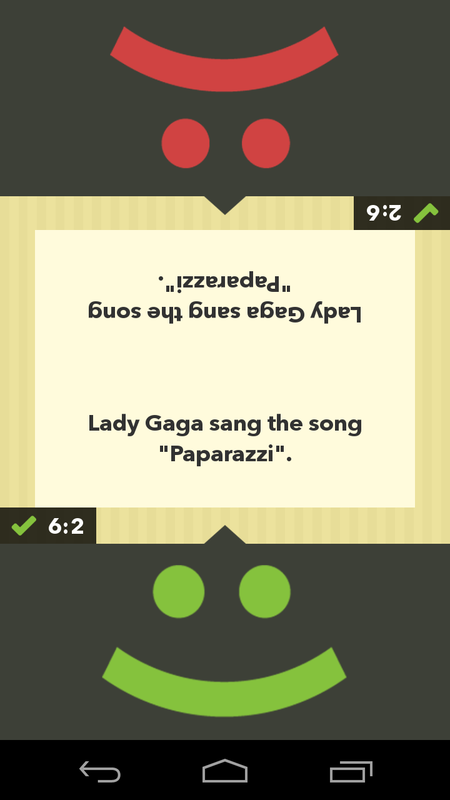 After an answer to the current statement is issued, the player is shown the answer and possibly also the corrected statement. 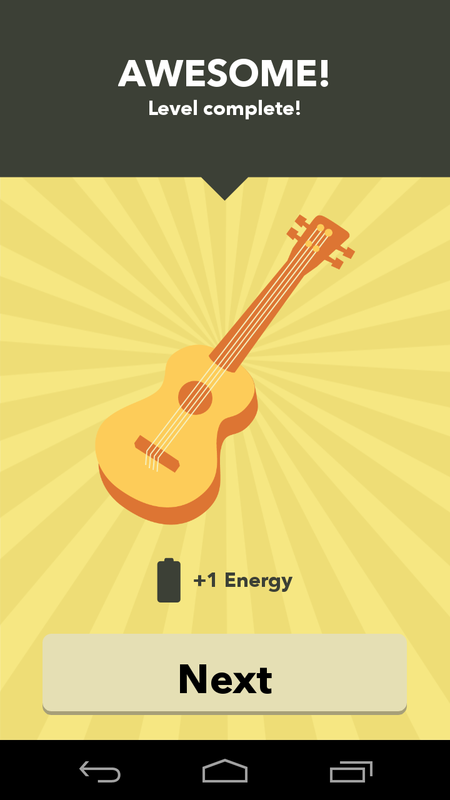 By completing a level, the player receives another energy bar. In multiplayer, two players can compete directly against each other at the same time. In this case, the screen is split and each player must evaluate the same statements in the given time. For each correct rating, players receive one point. Even in multiplayer the correct statements are displayed if you guess wrong. In-game advertising is almost constantly displayed, however. To get around this, the user has the possibility to connect the app with Facebook. This option not only lets you share scores with friends and gain extra lives, but it also removes the advertising. True or False - Test Your Wits is a really fun game for in between times. You couldn't play for hours on end though because the game is kind of lacking in variety. While there is a couple of different play modes there's not much else available to change the scenery, other than challenging a friend. But even this is just more of the same. True or False - Test Your Wits is nicely presented graphically. 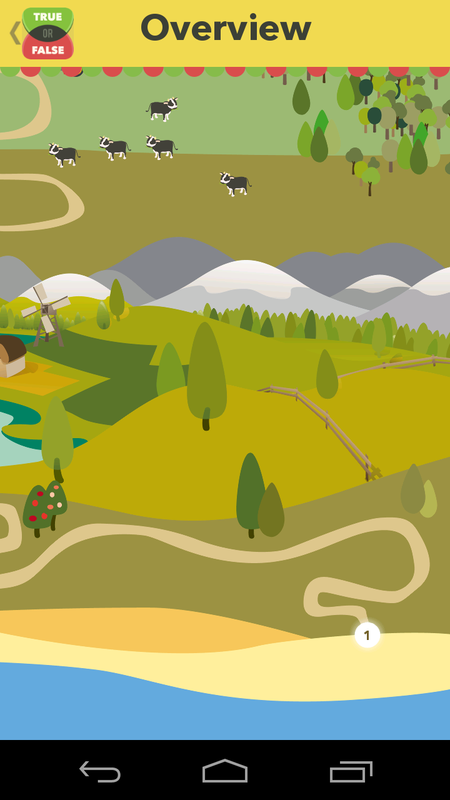 The app is beautifully designed and decorated entirely in cartoon style. You'll find yourself immediately familiar with how to navigate the game so there's no need to deal with instructions or spend time getting used to controls. Splitting the screen in multiplayer mode works fine on a normal phone and all buttons are easy to reach. During most of the test phase True or False - Test Your Wits performed with no problems. Again and again, however, there started to be small hangers and longer waiting times. True or False - Test Your Wits is available for free in the App Center. It comes with plenty of advertising, but that hardly disturbs the gameplay and it can be removed if you're willing to link the app with with Facebook. The game has thousands of statements to answer, so you won't work your way through it in any real hurry either. Is it that if it is True that it is False then is it True ??? I have reachd level 127.